Where did all the tail clubs go? Today is a New Paper Day! This time, we’re talking about the evolution of tail weapons! Readers of this blog will not be surprised to know that I find ankylosaur tail clubs quite interesting. 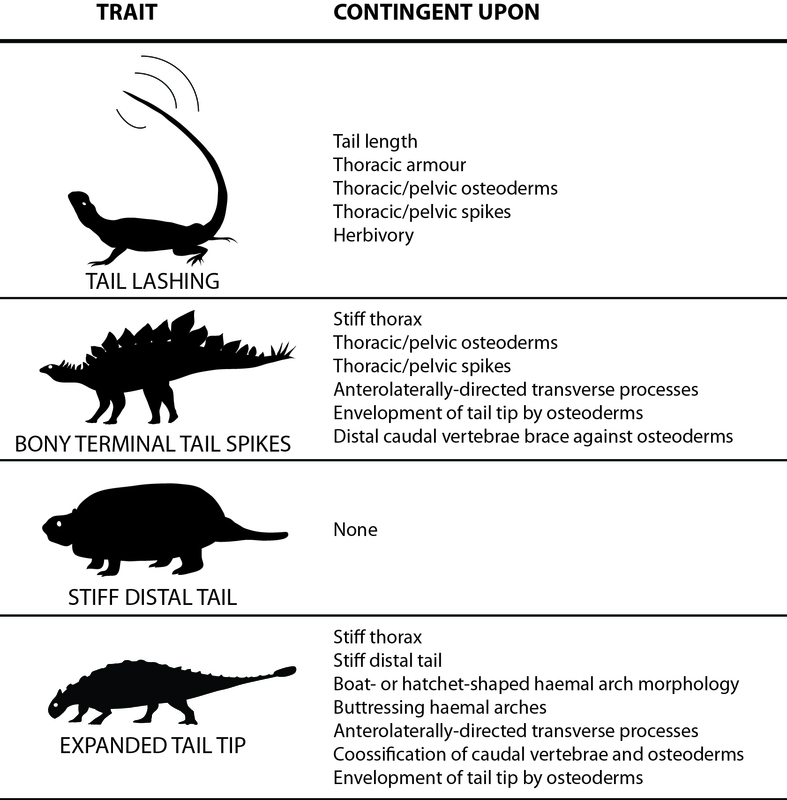 I’ve been lucky to get to study their biomechanics and whether or not they were plausible weapons, how their morphological variation helps us identify different species, and how they evolved in a stepwise manner, with the stiff handle evolving before the enlargement of the osteoderms at the tip of the tail. Occassionally it’s good to step back and just think about how *weird* it is that ankylosaurs modified their tails in this fashion, and how weird it is to have a weapon on the tail. 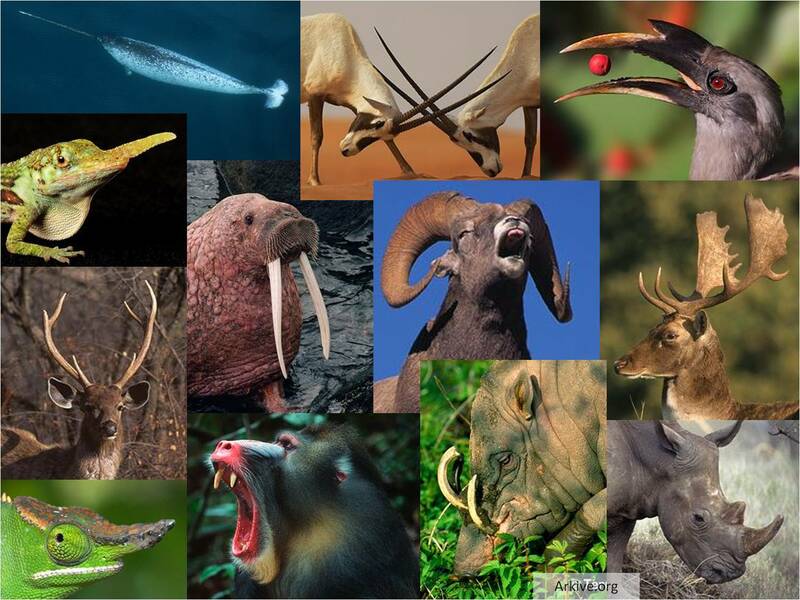 Weapons are widespread in the animal kingdom – here we’ve got the enlarged teeth of narwhals, babirusa, walrus, and mandrills, antlers in sambar and fallow deer, bony horns in oryx, keratinous horns in rhinos, protuberances in chameleons and anoles, and even the casques of some hornbills. Weapons come in lots of different shapes and are often used for fighting members of the same species; weapons tend to evolve when an animal needs to guard some kind of resource related to reproduction, like food, burrows, or even females themselves. Animal weapons are very interesting and there’s still lots to learn about how they evolve – I highly recommend picking up Doug Emlen’s book Animal Weapons for an engaging overview of their evolution and comparisons to human weapons. Weapons are easy to spot in the fossil record, too: they’re found on (starting clockwise from top left) Triceratops (at the Royal Ontario Museum), the rodent Ceratogaulus (at the Smithsonian), the dinocephalian Estemmenosuchus (at the Royal Tyrrell Museum of Palaeontology), the dicynodont Placerias (at the New Mexico Museum of Natural History), the protoceratid Syndyoceras (at the American Museum of Natural History), the tethythere Arsinoitherium (at the Canadian Museum of Nature), and the extinct pronghorn Stockoceros (at the LA County Museum). One thing that should be clear by now is that it’s really, really common to have some kind of weapon on your head, or at least towards the front of your body. What’s not common is to have a weapon on your tail, and yet some species DID evolve tail weaponry. Tail weapons are found in a few species scattered across the amniote family tree. My favourite example, the ankylosaurine ankylosaurs, stiffen the vertebrae in the back of the tail and expand the tail tip with huge osteoderms, to make a tail club. Glyptodonts also have tail clubs, but they’re constructed very differently: the tail is stiff because the vertebrae are encased in a rigid tube of osteoderms, which flares out at the tip in some species. Stegosaurs have huge bony spikes at the tail tip, and some sauropods (like Shunosaurus) enlarge the last few tail vertebrae themselves on an otherwise long flexible tail, forming a flail-like weapon. And finally, some incredibly weird extinct turtles, the meiolaniids, also encase the tail in an osteoderm tube like glyptodonts, but this tube tends to be spiky and tapering towards the tip. During my postdoc at the North Carolina Museum of Natural Sciences and at North Carolina State University, Lindsay Zanno and I became interested in understanding what patterns might underlie the evolution of bony tail weapons. Were any features correlated with the presence of bony tail weapons, and what can that tell us about how they evolve? Do modern animals use their tail as weapons, and do they share anything with the extinct species that had bony tail weaponry? 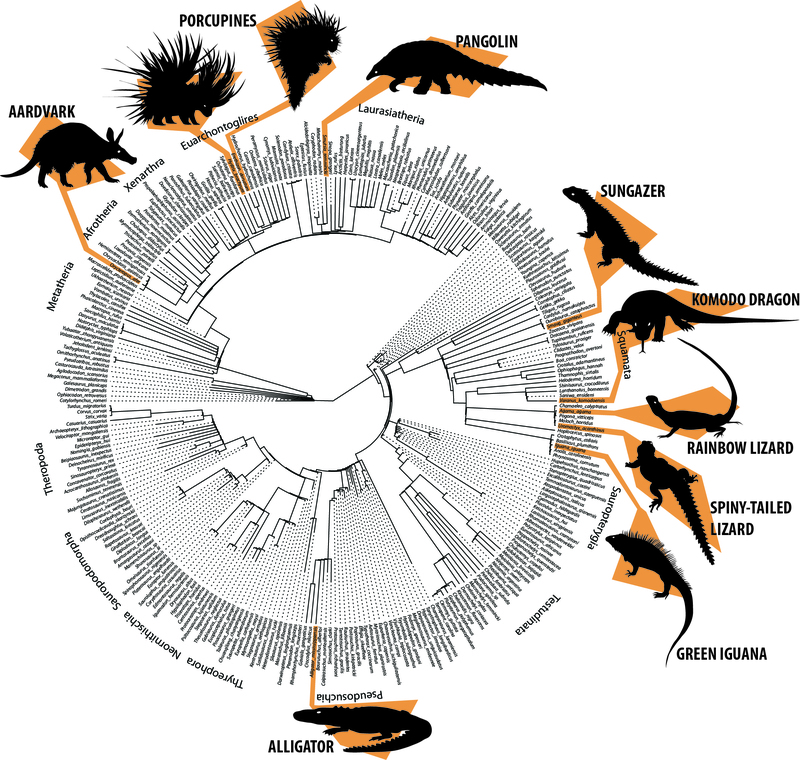 We assembled a dataset that included mammals, birds and reptiles both living and extinct. 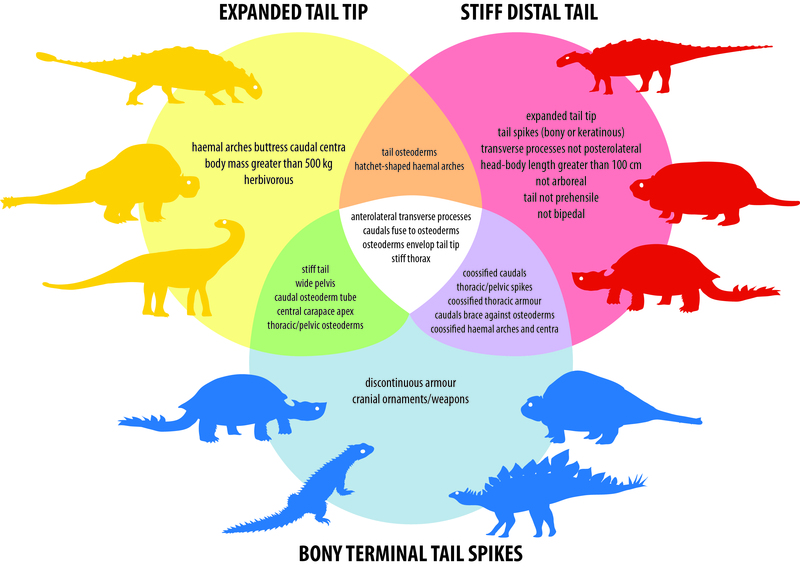 We divided our bony tail weapons into three main anatomical traits: 1) is the tip of the tail expanded (like in ankylosaurs, glyptodonts and sauropods), 2) is the back part of the tail stiff (like in ankylosaurs, glyptodonts, and turtles), and 3) are there bony spikes at the tip of the tail (like in stegosaurs, some glyptodonts, and turtles). We also collected information on which animals alive today use the tail as a weapon – it’s not a very common behaviour, as it turns out, or at least it isn’t a behaviour people think to report when they see it. Most animals use their tail as a weapon to deter predators, but one lizard, the rainbow agama, uses its tail to compete for mates! We then made a dataset of features that we thought might be relevant to evolving tail weapon behaviour or bony tail weapons – things like body size, diet, habitat, the presence of armour, and features of the tail like the shape of the tail bones. We used a program called BayesTraits to look for correlations between those traits and our tail weapon traits. Even though tail weapons take different forms in different species, we did find some trait correlations to be shared between the different bony tail weapon traits. 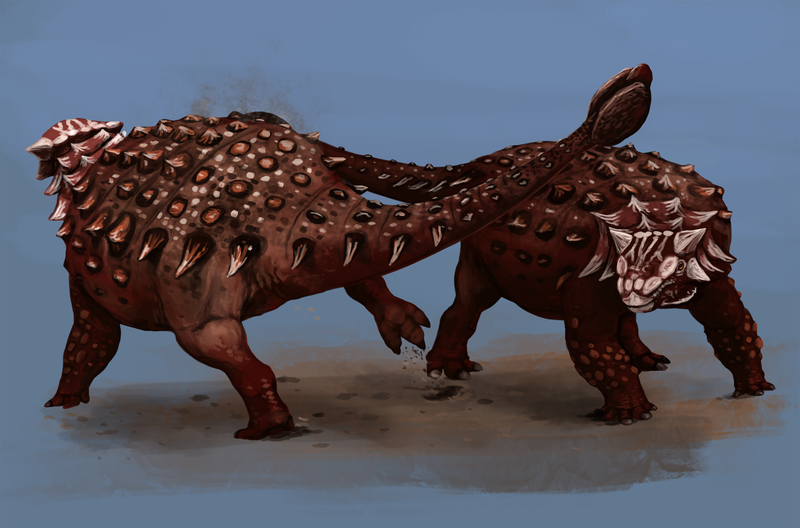 Some traits, like having an expanded tail tip, were correlated with large body size, and most of the traits were correlated with having some kind of armour, either as bony osteoderms or horny spikes. One interesting correlation shared by all of our traits was the presence of a stiff body – perhaps swinging the tail from side to side needs additional bracing in the torso in order to be effective. We also found some trait correlations to be shared between any kind of bony armour and animals that we know use their tail as a weapon today. In particular, being armoured, relatively large, and herbivorous was correlated with bony tail weapons and using the tail as a weapon. We also ran some tests to see if some traits were contingent on the state of the other trait. One really interesting result here is that having an expanded tail tip is contingent on having a stiff tail – meaning a tail club knob is more likely to evolve when a tail club handle already exists. This matches what the fossil record tells us about the evolution of ankylosaur tail clubs, where the handle appears in the fossil record before the knob. Overall, we found that evolving a bony tail weapon was correlated with body armour, size, diet, and body stiffness. Since large armoured animals are already rare, it’s probably unsurprising that bony tail weapons are also rare. It’s interesting to note that almost all examples of bony tail weapons are formed from dermal armour, i.e. osteoderms. 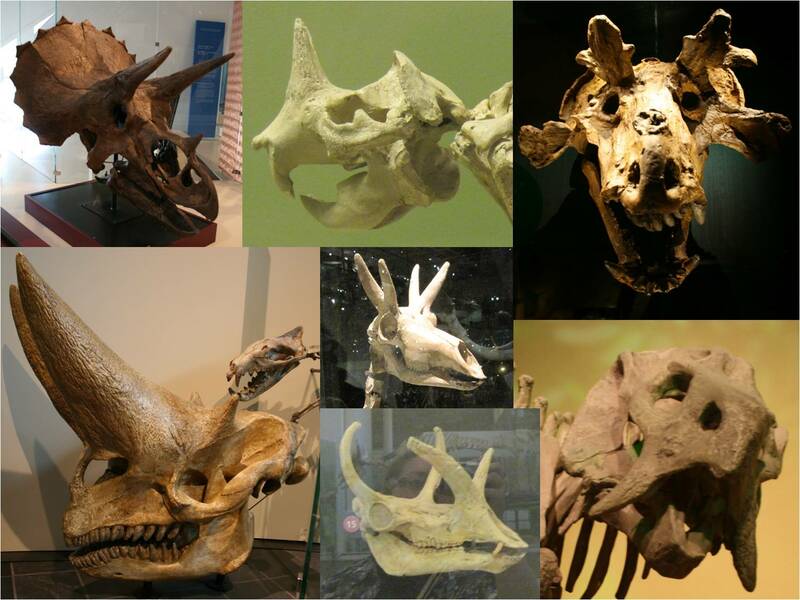 Head weaponry can be formed from outgrowths of the skull itself, like antlers, or from teeth, or from new centres of ossification, like cow and antelope horns. In contrast, the spikes or knobs found in tail weapons are not usually formed from the tail vertebrae, but from dermal armour surrounding those vertebrae. Large armoured herbivores are uncommon in the fossil record, probably because of the tradeoffs between armour, body size, and other defensive strategies. Being large is a pretty good way to avoid predation, and bony armour is physiologically expensive for a body to maintain. And it’s also worth reiterating that using the tail as a weapon is very uncommon among living terrestrial animals – since this behaviour is rare, it seems like there are probably fewer opportunities for specialized tail weapons to evolve at all. That’s all for now – check out the paper here: Arbour VM, Zanno LE. 2018. The evolution of tail weaponization in amniotes. Proceedings of the Royal Society B 285: 20172299. Many thanks to the Jurassic Foundation for supporting museum travel and data collection for this project! I wonder if evolution of tail weaponry is correlated with presence of bipedal carnivores (theropod dinosaurs in case of ankylosaurs/stegosaurs and flightless birds in case of glyptodonts). I guess, bipedal carnivores are more vulnerables to hits on the hind limbs than today’s quadrupedal ones. Tail weapons can be effective against any predators, bipedal or not. 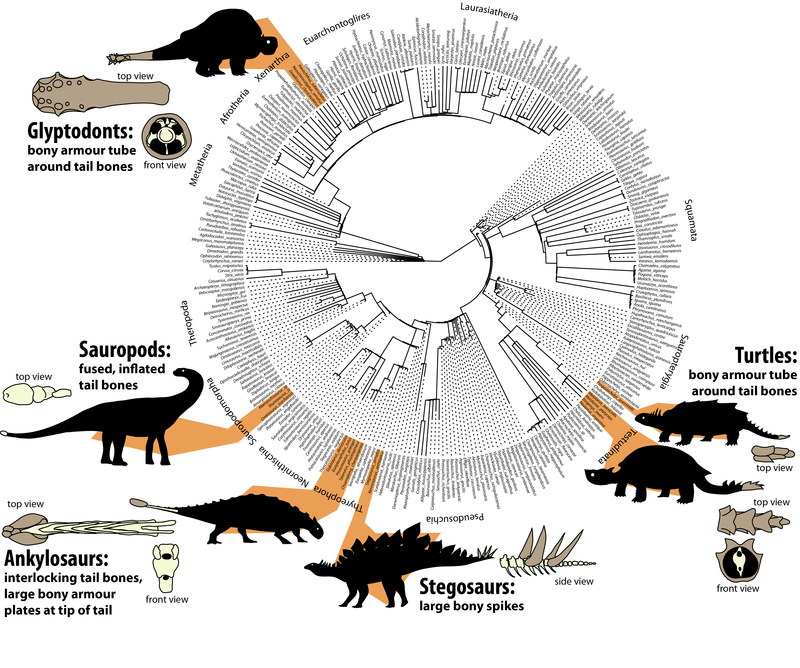 Saber toothed cats may have threatened glyptodonts. But I don’t doubt clubs evolved to deal with predators. Btw Jinyunpelata requires a major revision of the club evolution timetable, appearing in a recent study…..The weapon obviously long predated the Campanian.